Embrace Me Mitts are the second pattern in the Winter 2015-2016 Shalimar Yarns Indulge Me! Club, and feature an exclusive, embraceable color of Breathless Cush yarn. For more information about Kristi’s lovely bases and colorways, check out Shalimar Yarns. Luxurious bulky yarn and a subtle Crossover Twist stitch pattern make these fingerless mitts special. Written in two sizes, they feature an atypical thumb gusset which creates a natural fit that is both comfortable and elegant. Techniques & Skills Used: cable CO, knit/purl, increasing/decreasing, working in the round. Size: S/M (M/L); 6.5 (7.5)” length and 7 (8)” palm circumference, measured flat and unstretched. 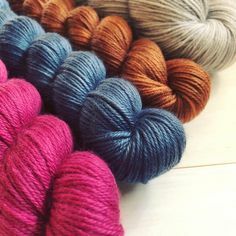 Yarn: Shalimar Yarns Breathless Cush (75% superwash merino wool, 15% cashmere, 10% silk; 145 yards/132m/114g); size M/L shown in Indulge Me! 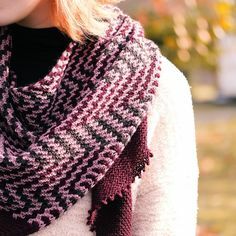 Yarn Club 2015 exclusive color Embrace Me; 1 skein. The sample used about 100 yards of chunky weight yarn. Other Materials: US 9 (5.5mm) dpns or 32” circular needle if using Magic Loop, or size to match gauge; Stitch markers (2); Stitch holder; Yarn needle. Gauge: 16 st and 22 rows/4” in Crossover Twist stitch pattern and in stockinette stitch, after blocking.